We house state-of-the-art laboratory for physics and updated laboratory for chemistry, biology, and computers for our students who are willing to create new collective knowledge and foster the next generation of scientific leaders. We harness the best of modern technology to support the intellectual curiosity of our students and faculty and to bestow best laboratory experience. 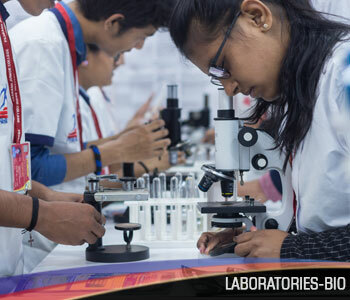 The Physics, Chemistry, Biology and Computer labs at Prakash College are all designed as per European standards with table tops made of epoxy resin and phenolic resin making them sturdy and chemical resistant. The heights and widths of the furniture are all created keeping in mind the Indian physique of students. All the drawers and cupboards doors are made for soft closing. All apparatus are not just new but also are precise with zero error reading. The windows and environmental friendly lighting are especially designed keeping in mind visibility.